As part of your local SEO (Search Engine Optimisation) strategy, every Perth business should ensure that they have taken full advantage of the various free business listing services included by major online search presences Google Maps, Bing Places and Apple Maps at the very least. There is a simple and free opportunity for businesses not able to yet afford a website to still have an online presence through the Google Website Builder. Not sure where to start? 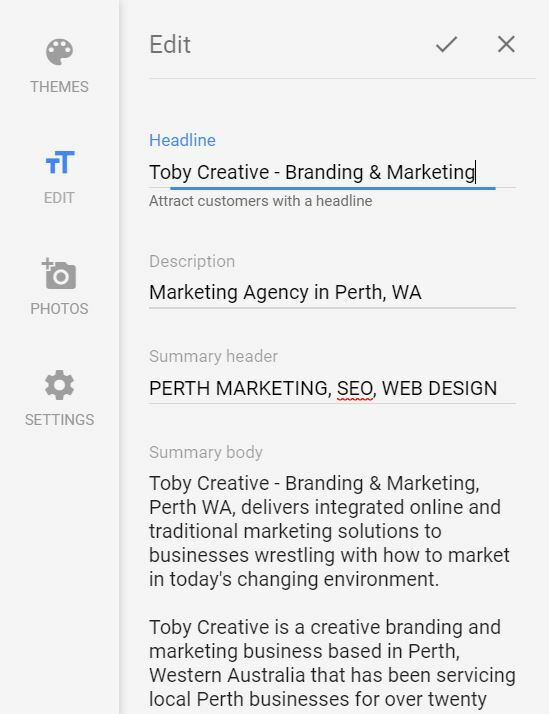 Contact your local Perth marketing agency Toby Creative – Branding & Marketing today on (08) 9386 3444, who are a Perth-based Google Partner agency, and whose staff are Google Local Guides as well as being highly engaged within the business map listing and business review process across multiple channels. 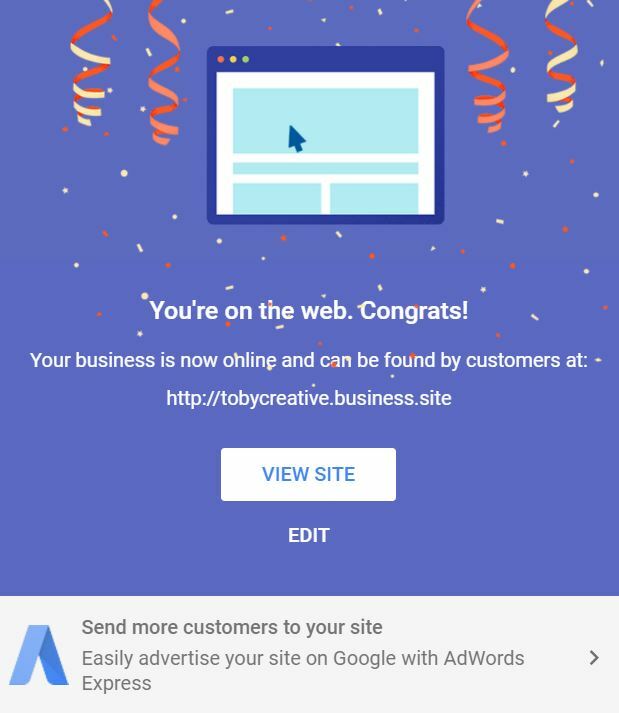 NEW in 2017 – Google officially launched its Google Website Builder product within Google My Business, which is an effort to help support small local businesses such as home businesses and micro-business easily and affordably create their own online presence quickly and simply. Visit our own TobyCreative.business.site to view the appearance and design layout of this website template builder from Google. This is a great initiative from Google, as there are many small businesses that do not have a website, and this provides the tools within the Google ecosystem to generate a simple template page online presence for your business. One of the most common consumer actions people take when exploring Google Search Engine Results (SERPs) is to go to the website of the business to find out more information. Unfortunately for many small business operators, with a limited marketing budget, having a website is still a complex, time consuming or expensive challenge. For businesses who are already well established with a website and other online property, consider also adding a Google Website Builder site to your arsenal, and perform your marketing – test and measure approach to see if it brings additional visibility to your brand and extra traffic. Please NOTE however, that you should not mark the Google Website Builder site as your primary representation within the search results, and rely upon your full primary website domain for this purpose. There is no cost associated to having a Google Website Builder website. As an add-on you can purchase a custom domain name, but this needs to be done through Google domains, otherwise you are assigned a YOURBUSINESSNAME.business.site address. As a sub-domain and long-term business strategy, this is not going to provide the same benefit of having your own custom domain name, and is not ideal for brand protection and control should Google choose to discontinue this service in the future. To participate with Google Website Builder, you do need to have a verified listing on Google My Business. Toby Creative can assist you with this process, as well as creating a consistent brand approach for your business with compelling copy, clear branding, and a well presented and effective design to engage with your intended audience. Within the Google Website Builder program, you have multiple theme options to select from to style the presentation of the fonts and colours. You can select the colour scheme and font type face that best suits your business branding. The Text Editor within Google Website Builder provides the option to edit elements such as Headline, Description, Summary Header and Body content including basic style formatting and adding external website links. 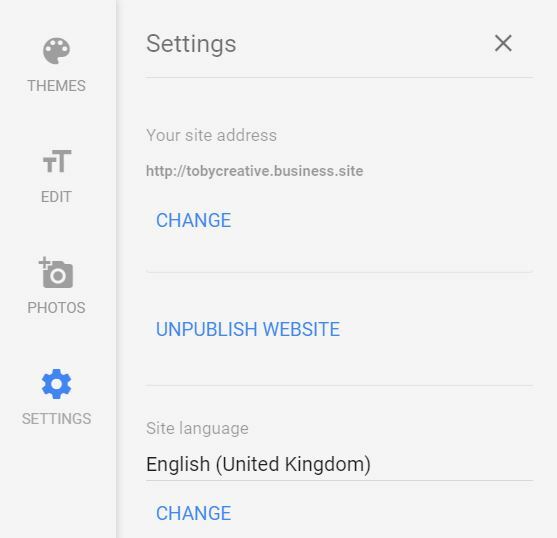 In the settings you can select or change your new Google Website Builder site address NAME.business.site, buy the custom domain through Google domains. If you need to disable or remove your Google Website Builder template website you can unpublish your website here. As your new Google Business Listing website is tied into your Google My Business listing, the information from this is automatically transferred across with an embedded Google Map to make it convenient for consumers to find your location, along with operational business hours and contact information. You are able to easily add a custom cover photo matching your branding, and add images associated to your business services, products or consumer experience. Note there is no Google Analytics integration for website traffic statistics, nor ability to have finite control over the template – you are stuck with the one single page, so you cannot optimise for SEO with advanced meta descriptions, schema mark-up, <alt> tags on images, or even CTA (Call To Action) buttons for example. It is however quick to build, and it is also mobile friendly. Consider this an addition – an extra benefit, not a replacement for having your own custom website for your business which you fully control. But it is a great starting point and better than having nothing if you are current stuck thinking about getting a website. Why is Google My Business all that important? As consumers look your business up within Google search, all the information is at their fingertips whether on mobile or desktop search. It provides a quick summary visually, contact details, opening hours and with location information conveniently ties into map directions literally driving consumers to your door! It provides trust signals through reviews either directly from Google My Business or a view of the brand sentiment from other channels such as Facebook. 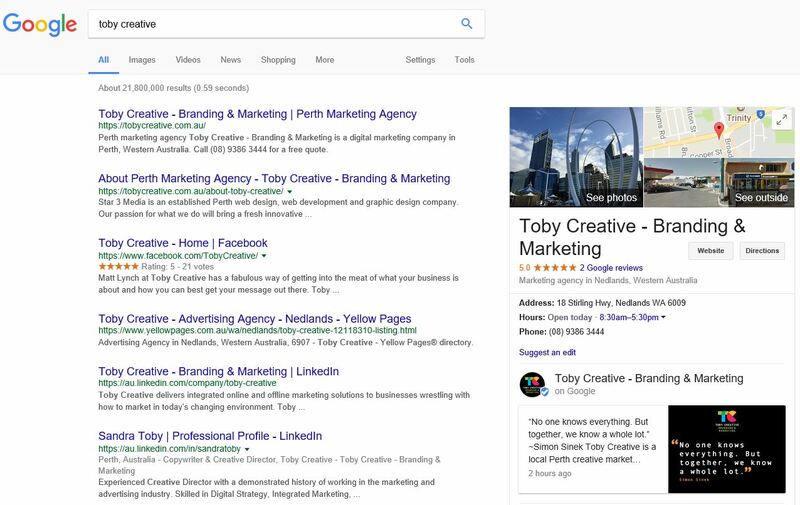 Would you like your business to dominate local search ranking and business listing results on the available map services then call Toby Creative – Branding & Marketing in Perth, WA on (08) 9386 3444 to book a no obligation free initial consultation at your location so that we can discuss your specific requirements. Great! 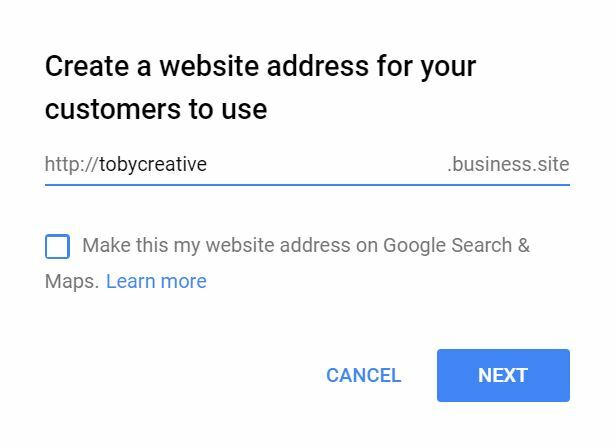 A simple solution from Google for businesses to have a no-cost presence online to feature their main details of the business, contact information, map link and operational hours. For those small one-man home based businesses, this is a good opportunity for them to take advantage particularly as they build their business presence and work towards developing their own domain name, website and online status.